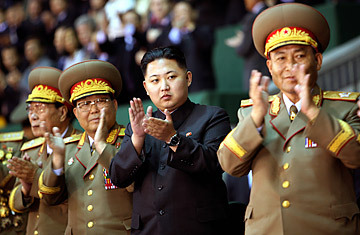 Kim Jong Un, third from left, the third son of North Korean Leader Kim Jong Il, applauds while watching the Arirang mass games performance staged to celebrate the 65th anniversary of the founding of the Workers' Party of Korea, in Pyongyang, North Korea, Oct. 9, 2010. The iconic painting hangs everywhere in North Korea  in the offices of party functionaries and in homes, in factories and in schools. Kim Il Sung, founder of the Democratic People's Republic of Korea (DPRK), is depicted with his son Kim Jong Il. They are standing in front of Mount Paektu, a sacred site where, legend has it, the first kingdom of Korea was formed. The image is the most familiar representation of a ruling dynasty that has, in just two generations, ground North Korea into abject poverty and international isolation. Both men are gone now  the Dear Leader Kim Jong Il dying on Dec. 17 of a heart attack at age 69, just as his father did 17 years ago. In the wake of his departure, all eyes are on the young man who isn't in the picture: 29-year-old Kim Jong Un. Since the late summer of 2008, when Kim Jong Il suffered a severe stroke, cadres in the ruling Workers' Party have been carefully grooming his third son, Kim Jong Un, for succession. Officially, that was to come in 2012, when North Korea will celebrate the 100th anniversary of Kim Il Sung's birth. The first indication that the succession plan still holds was Pyongyang's announcement on Dec. 19 of the formation of a 232-member "funeral commission," which will be headed by the younger Kim. The funeral is scheduled for Dec. 28. Of late, Kim Jong Un has gained prominence in North Korea, putting on weight and bearing an unmistakable resemblance to his beefy grandfather Kim Il Sung. Most diplomatic and intelligence sources say there is little reason to suspect that his position as the heir is anything other than legitimate. Since 2008, he has been in charge of North Korea's police and intelligence services, two key ministries of political control. Last year, he was given general's stars in the military and named vice chairman of the powerful Central Military Committee. Kim Jong Un's father had worked steadily to align his own interests with those of the military  one of the reasons, NGO officials have said, that so much food aid over the years intended for the general population has been diverted to the army. The Dear Leader's steadfast pursuit of a nuclear arsenal  and his unwillingness to trade the North's nuclear capability for economic favors from the outside world  was also in alignment with the military's wishes. "One has to presume the son would never have been put in this position [of] heir apparent had the generals not approved," says a diplomatic source in Seoul. Less certain is the political future and fate of the Dear Leader's brother-in-law Chang Sung Taek. After Kim Jong Il's stroke, Chang emerged as a regent-like figure, apparently on hand to guide Kim Jong Un should the young man have to assume leadership suddenly. However, on a recent visit to Pyongyang by TIME, a person who has met occasionally with Kim Jong Il (including earlier this year) asserted that Chang no longer occupies such a position. If that is true, it could be an indication of political infighting at the highest echelons of the DPRK. Kim Jong Il's death comes just days after a bilateral meeting in Beijing between U.S. and DPRK officials, at which U.S. special envoy for human rights Robert King held talks with a senior DPRK foreign ministry official. Unconfirmed press reports in Seoul say Pyongyang agreed to allow inspectors from the International Atomic Energy Agency back into the country to impose a moratorium on nuclear and missile tests and to suspend its uranium-enrichment program, in return for 240,000 tons of food aid. However, analysts believe that this diplomatic momentum may be slowed by Kim Jong Il's death. As Kim Jong Un consolidates his political power, "North Korea will become even more inward-looking, at least for a while," says Bruce Klingner, senior fellow at the Heritage Institute and a former North Korea watcher at the CIA. The good news, for an outside world that lives in fear of erratic behavior from the North, is that the younger Kim has had three years to prepare for the assumption of dictatorial power. "There's less of a concern about instability now than had Kim Jong Il died three years ago," Klingner says. At the same time, the DPRK has gone through a transition like this only once before, and that was when Kim Jong Il was 52 years old. The country is once again having problems feeding itself, its economy is moribund, and problems are falling to a 29-year-old. It's a safe bet that if North Korea's propaganda artists haven't already prepared new iconography depicting the youngest Kim alongside his father and grandfather at Mount Paektu, they're busy doing so now. See "North Korea's Next Kim: Dad's Favorite, Kim Jong Un." See TIME's Top 10 Everything of 2011.